As the baby boomer generation reaches retirement age, the demand for senior housing is skyrocketing. Also, as medical procedures, treatments, and diagnosis continue to improve, so does our life expectancy. This combination means that your aging parents and loved ones are more likely to need long-term care. And many over-stretched families are not prepared to care for an elderly loved one full-time—especially those who suffer from Alzheimer’s and other forms of dementia. Memory care may be a long-term care solution for your parent suffering from memory loss. Although some assisted living communities have memory care units in their buildings, these are distinct care options. 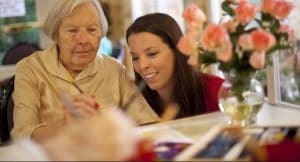 Memory care is specifically designed to meet the unique needs of residents living with Alzheimer’s disease and other forms of dementia. A memory care community (either as part of an assisted living community or stand-alone) personalizes care for each resident wherever they are in their progression of memory loss. Staff are specially trained in caring for people living with all phases of dementia. What to expect in a memory care community? Trained Staff. Caregivers should have the knowledge, patience, empathy and understanding needed to provide the level of specialized care required for people living with dementia. Caregivers should be specially trained to manage the characteristics and behaviors associated with all phases of memory loss. There should be 24/7 staff that will ensure the safety and health of those in their care. Care managers are sensitive to the needs and frustrations of those with memory loss. They can manage challenging behaviors and redirect residents who may be agitated or anxious. Safe and Secure. Assisted Living communities specializing in dementia care are designed to keep residents safe, as well as comfortable. Some people suffering from dementia want to wander or seek an exit due to confusion, so camouflaged locked doors, delayed egress, and motion sensors keep residents secure. Residents should also be provided with wearable call buttons connected to an emergency call system. Nutrition and Wellness. People with memory loss can forget to eat, or overeat, so a dietary program is vital to monitor their nutrition, boost their immunity, keep them hydrated, and encourage healthy eating. A poor diet may lead to increased behavioral issues. Food should not only be delicious but visually appealing and easy to eat. A Social Model. Residents are not isolated. Programs and activities are catered to residents’ cognitive level and inclusive to keep all residents engaged and happy. Living among friends and being cared for by skilled caregivers can significantly improve quality of life. Life Enriching Activities. Many communities offer stimulation and activities to keep residents engaged and connected to fond memories. In Aegis Living communities our Life Enrichment program provides a full day of activity options for residents, to stimulate their minds, support physical health and provide the benefits of socializing with other residents who have become friends. Not all memory care communities are exactly the same. Visit a number of communities, take the time to have all of your questions answered, speak with other family members with loved ones in that community, and meet the care staff. The right community will continue to provide the fulfilling life for your parent with the care and dignity they deserve.